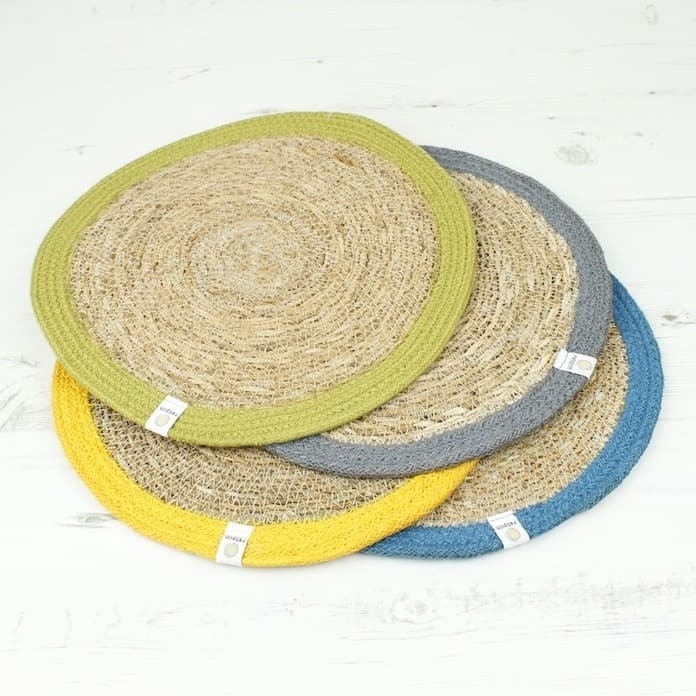 These round, woven seagrass table mats with a grey jute rim will look great on your table. 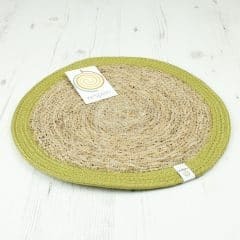 Both seagrass and jute are naturally renewable, sustainable and biodegradable materials making this an ideal table accessory for the environmentally conscious. 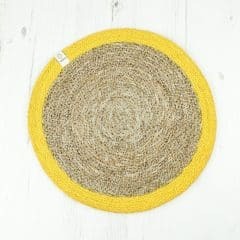 Naturally renewable and sustainable jute. Round, woven seagrass tablemat with denim blue jute rim. Comes with a little fabric ReSpiin label and swing tag. 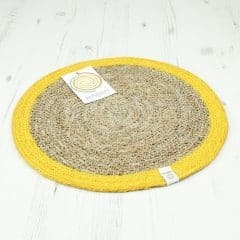 Hand made responsibly in Bangladesh. 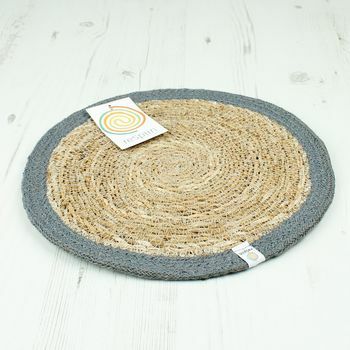 Both seagrass and jute are naturally renewable, sustainable and biodegradable materials. 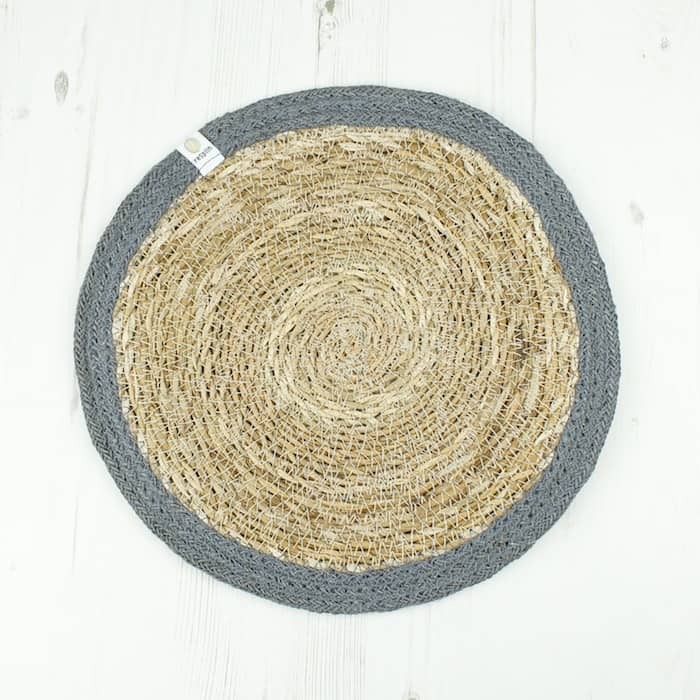 Made from sustainably harvested soft jute, this soap bag is an essential for every Eco friendly bathroom. This 2 in one tool allows you to wash whilst exfoliating in a easy and convenient way. 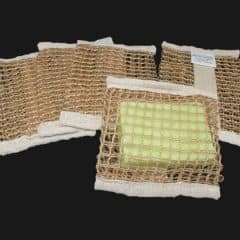 You just get a slice of soap and slip inside the bag, and you are ready for exfoliating your skin! This is a great way to use the leftover pieces of soap and avoid any unnecessary waste. 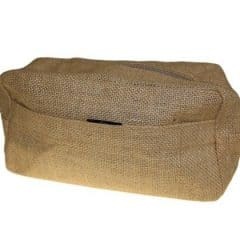 This handy jute toiletry bag is perfect for your travels. 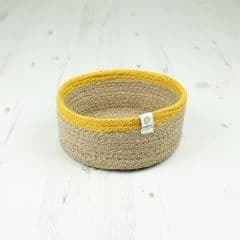 Its completely natural, made from one of the most Eco-friendly, biodegradable materials around and is printed with natural dyes making this a great environmentally toiletry bag. Features a zip and handy font pocket to store all your essential toiletries. Top zip and side pocket. 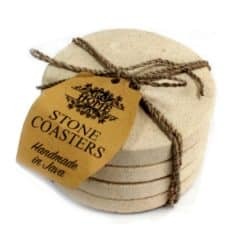 This set of 4 hand carved, round, Indonesian sandstone coasters make a perfect addition to any table. 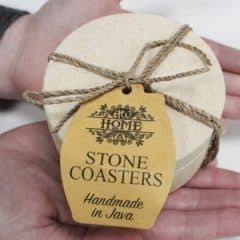 Made from natural stone each coaster varies slightly in shade and markings making each one unique. 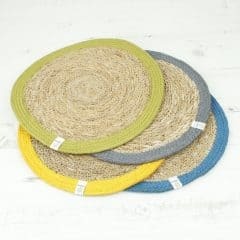 These coasters will protect your tables from water rings, drips and scratches and have small pads on the bottom to offer extra protection. 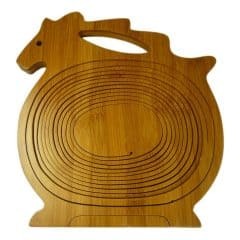 Protects table from drips and scratches.